I can't believe May is over already! I read a total of 4 books and 1 graphic novel this month and I am quite happy with that. Please note that I have been immensely harsh with my ratings because I have been more critical with my reading and I have been trying not to throw around high ratings to books that don't deserve them in my eyes. The first book I read this month is Dorothy Must Die by Danielle Paige. I wrote a detailed review on this book which you can view here. 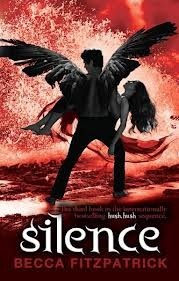 I really enjoyed this book and I gave it ★★★.5 /5 stars. I then finished Girl Online: On Tour by Zoe Sugg. This was an ok read. Not too bad, but defiantly not the best either. I felt as if this read like a fan-fiction so I read it relatively quickly. It was not very original though. I had read a lot of books before with the exact same plot line which was annoying. I gave this book ★★★/5 stars. This may be a funny one to choose, but I love the name Anastasia (50 Shades of Grey)so much! The name is so beautiful! I also love the name Kai as in Kai from The Lunar Chronicles! It's such a cute name and I love the look of it. Hi guys :) I saw this thing over at dreamland book blog and I thought it was awesome so I wanted to try it out too seeing as I am reading The Percy Jackson series right now! This survey was created by Flip That Page, and the main idea of the whole thing is that you have to answer a number of questions, one for each god/character from Rick Riordan’s Heroes of Olympus and Percy Jackson and the Olympians-series. Soo, 2 days ago I finished Percy Jackson and the Sea of Monsters by Rick Riordon and it was fabulous! I am currently on page 86 of 438, so I have only just began. I am really enjoying it so far and I surprisingly remembered a lot about the last 2 books! I hope you have an amazing weekend full of reading! These are characters that you love, but no one else seems so you are constantly defending them! Peeta has often been portrayed as weak or useless, but this amazing trilogy would not have been the same at all without him. For me he brings so much to the table and I just love him! Yes I did hate him in the first book, but didn't everybody? As I read the next books I fell madly in love with him. A lot of people, even after reading the other books still don't like him and I just do not understand their train of thought because HOW?! Hi guys :) I saw this thing over at dreamland book blog and I thought it was awesome so I wanted to try it out too seeing as I am reading The Percy Jackson series right now! This survey was created by Flip That Page, and the main idea of the whole thing is that you have to answer a number of questions, one for each god/character from Rick Riordan’s Heroes of Olympus and Percy Jackson and the Olympians-series. I only did half of this tag. I didn't do the characters part. I will do the next part in another post! Enjoy this extra large post! I am so excited about this! Zeus (Jupiter) God of the Sky and Thunder / King of the Gods Favourite Book: I sometimes tell myself that I haven't read it yet, but my favouite book that I have read so far in my lifetime would have to be Clockwork Princess. The third book in The Infernal Devices. This book blew me away like no other book I have ever read. 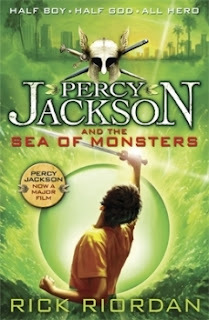 So, I am currently reading Percy Jackson and the Sea of Monsters by Rick Riordon and I am loving it soo much! Greek mythology interests me and I find Rick's writing so amusing and fun! I am on page 91 of 279 at the moment. I was hoping to finish it by the end of the weekend, but I am working all day Sunday so I'm not sure that will be happening, but I hope so! Lately I have been trying new places to read to find my desired spot. I only try to read on my bed if I am trying to go to sleep because otherwise I will fall asleep or lose my ambition to read. My bed is just too comfy! I love reading on my bed though, it is by far the most comfortable place to read. I think I am most alert when I am sitting on a chair. I get the most reading done and I feel much more awake on a chair rather than in bed! It is probably the least comfortable though. I need to find a really comfy chair so I can read for days at a time! As I have grown up always living across the road from the beach, I feel as if the waves calm me. It is so peaceful and quiet if you find the right place at the beach and you also get a tan which is a total bonus. I also love reading outside. It gives me such a fresh feeling and a sense of living life. If you want to know everything about this T5W, you can click on thisamazing link which will take you to Goodreads. T5W was created by Lainey but is now managed by Samantha. 5. Paper Towns - John Green This book is filled with many summery feels. It is set at the end of the school year and they go on a road-trip so I was feeling a lot of summer vibes from this book! Oh and it's John Green so that is something too. 4. Fangirl - Rainbow Rowell Fangirl is an easy, quick and relatable read. That is exactly what I love to read in summer. Although, the majority of it is set in University, I still consider it as an awesome summer read. 3. To All The Boys I've Loved Before - Jenny Han This book is so cute! I loved the happiness I got from this book. The romance was adorable and it had the same sensation as the rest of these books. 2. What was the last truly great book that you read? Thirteen Reasons Why - Jay Asher. That book hit me like a grenade. 3. If you could meet any writer – dead or alive – who would it be? And what would you want to know? J.K. Rowling. I would just love to fangirl with her about her thoughts about creating the wizarding world. 5. How do you organize your personal library? Mostly by height, but all of my series have to be together or I'll go crazy! 6. What book have you always meant to read and haven’t gotten around to yet? Anything you feel embarrased never to have read? I have wanted to read The Darkest Mind for the longest time. Goodreads Summary: Orphaned Heidi lives with her gruff but caring grandfather on the side of Swiss mountain, where she befriends young Peter the goat-herd. She leads an idyllic life, until she is forced to leave the mountain she has always known to go and live with a sickly girl in the city. Will Heidi ever see her grandfather again? A classic tale of a young girl's coming-of-age, of friendship, and familial love. My Review: I decided to pick this book up as it had been sitting on my shelf for a very long time and it is a children's classic, so better late than never. I really quite enjoyed this. I hope you all have a lovely weekend and that you are as excited as I am for it! 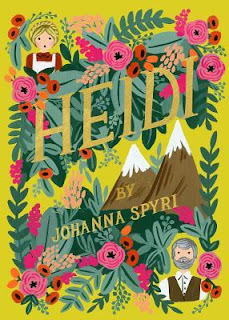 I am hoping to complete Heidi by Johanna Spyri this weekend as it isn't that long and my edition has very big print and has illustrations too.